Please contact us to get a full floor-plan for the Yellowhead Hall and design your setup! Weddings ~ Socials ~ Banquets ~ Showers ~ Sales ~ Meetings/Conferences ~ Funerals ~ Fashion Shows ~ Whatever is it The Yellowhead Hall has everything you could need to host any event plus a friendly staff ready to help! Beautiful hardwood floors just made for dancing and a rare feature for a small town that can accommodate a huge crowd and can be MLCC licensed for 751 guests. Our old time antique bar is always a topic of conversation. 40 round tables ($5 each) are available for rent. As part of your rental fee 40 3×8 new plastic tables, 20 white 3×8 wooden tables along with 419 upholstered chairs and100 folding chair are available. There is also a 4ft new round table that works for a cake table! Sound system and video equipment installed in the hall and available for all renters…whether it be a power-point or DVD presentation you wish to show…two cordless mics and a headset along with wired mics are here for your use. A wide variety of decorations are available to rent and can be soon seen here…for now check them out on our Facebook page…Many great ideas. 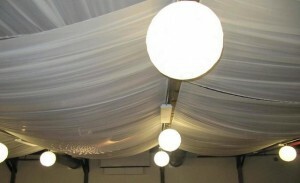 Ceiling Feature with Lanterns – Lanterns – 10in round mirrors – 4in square mirrors- lots to choose from! Come have a look!